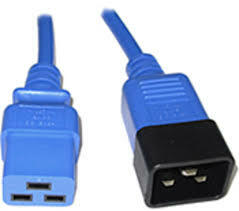 Today IEC plugs are used at the rack-level PDU and the IT device. IEC plugs backing out of sockets create a significant concern, since these plugs feed UPS power to the device. In the past, twist-lock cord caps were used, but these did not address the connection of the IEC plug at the IT device. Retainers are a way the industry has addressed this problem. In one case, Uptime Institute evaluated a facility in the Caribbean (a Tier Certified Constructed Facility) which was not using the retainers. While operators had checked all the connections two weeks earlier, when they isolated one UPS during the TCCF process, a single cord on a single device belonging to the largest customer was found to be loose and the device suffered an interruption of power. The International Electrotechnical Commission (IEC) plug is the most common device used to connect rack-mounted IT hardware to power. In recent years, the use of IEC 60320 cords with IEC plugs has become more common, replacing twist-lock and field-constructed hard-wired type IEC plug connections. During several recent site evaluations, Uptime Institute has observed that the IEC 60320 plug-in electrical cords may fit loosely and accidentally disconnect during routine site network maintenance. 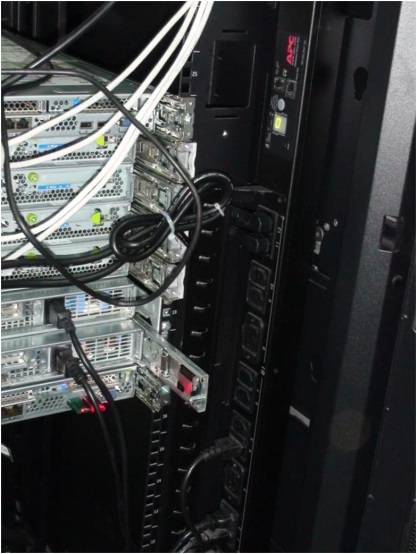 Some incidents have involved plugs that were not fully inserted at the connections to the power distribution units (PDUs) in the IT rack or became loose due to temperature changes fluctuations. This technical paper will provide information related to cable and connector installation methods that can be used in ensuring a secure connection at the PDU. The IEC publishes consensus-based international standards and manages conformity assessment systems for electric and electronic products, systems and services, collectively known as electrotechnology. The IEC 60320 standard describes the devices used to couple IT hardware to power systems. The plugs and cords described by this standard come in various configurations to meet the current and voltages found in each region. This standard is intended to ensure that proper voltage and current are provided to IT appliances wherever they are deployed (see http://www.iec.ch/worldplugs/?ref=extfooter). The most common cables used to power standard PCs, monitors, and servers are designated C13 and C19. Cable connectors have male and female versions, with the female always carrying an odd number label. The male version carries the next higher even number as its designation. C19 and C20 connectors are becoming more common for use with servers and power distribution PDUs in high-power applications. Most standard PCs accept a C13 female cable end, which connects a standard 5-15 plug cord set that plugs into a 120-volt (V) outlet to a C13 male inlet on the device end. In U.S. data centers, a C14/C13 coupler includes a C14 (male) end that plugs into a PDU and a C13 (female) end that power plugs into the server. Couplers in EU data centers also include C13s at the IT appliance end but have different male connectors to the PDU. These male ends are identified as C or CEE types. For example, the CEE /7 has two rounded prongs and provides power at a 220-V power. In data centers, PDUs are typically configured to support dual-corded IT hardware. Power cords are plugged into PDU receptacles that are powered from A and B power sources. During installation, installers typically plug a cable coupler in a server outlet first and then into a PDU. Sometimes the cord is longer than the distance between the server outlet and the PDU, so the installer will coil the cable and secure the coil with cable ties or Velcro (see Figures 1 and 2). This practice adds weight on the cable and stress to the closest connection, which is at the PDU. 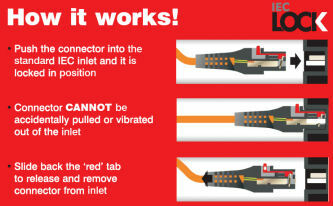 If the connection at the PDU is not properly supported, the connector can easily pull or fall out during network maintenance activity. 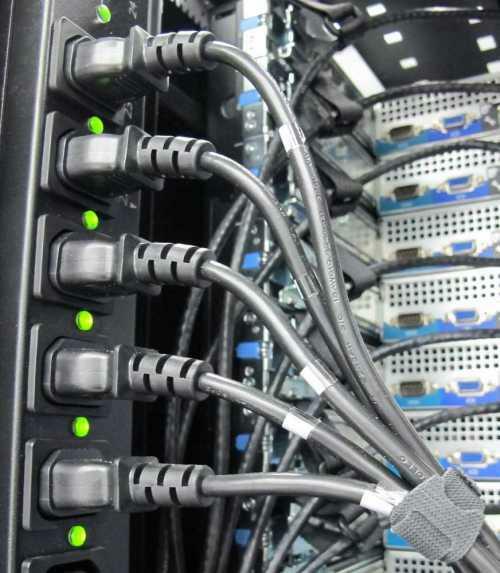 Standard methods for securing PDU connections include cable retention clips, plug locks, and IEC Plug Lock and IEC Lock Plus. Cable retention clips are the original solution developed for IT hardware cable installations. These clips are manufactured to install at the connection point and clip to retention receptacles on the side of the PDU. Supports on the PDU receive the clip and hold the connector in the receptacle slot (see Figure 3). Plug lock inserts prevent power cords from accidentally disconnecting from C13 output receptacles (see Figure 4). A Plug lock insert place over any C14 input cord strengthens the connection of the plug to the C13 outlet, keeping critical equipment plugged-in and running during routine rack access and maintenance. C13 and C19 IEC Lock connectors include lockable female cable ends suitable for use with standard C14 or C20 outlets. They cannot be accidentally dislodged or vibrated out of the outlets (see Figure 5). The IEC Plug Lock and IEC Lock Plus are also alternatives. Both products have an integral locking mechanism that secures C13 and C19 plugs to the power pins of the all C13 and C19 outlets. Manufacturers of IEC plugs over the recent years have developed technologies in new and existing plug and cable products to help mitigate the issue of plugs working their way out of the sockets on both IT hardware and PDU power feeds. As these connections are audited in the data center, it is good practice to see where these conditions exist or could be created. Having a plan to change out older style and suspect cables will help mitigate or avoid incidents during maintenance and change processes in data centers. 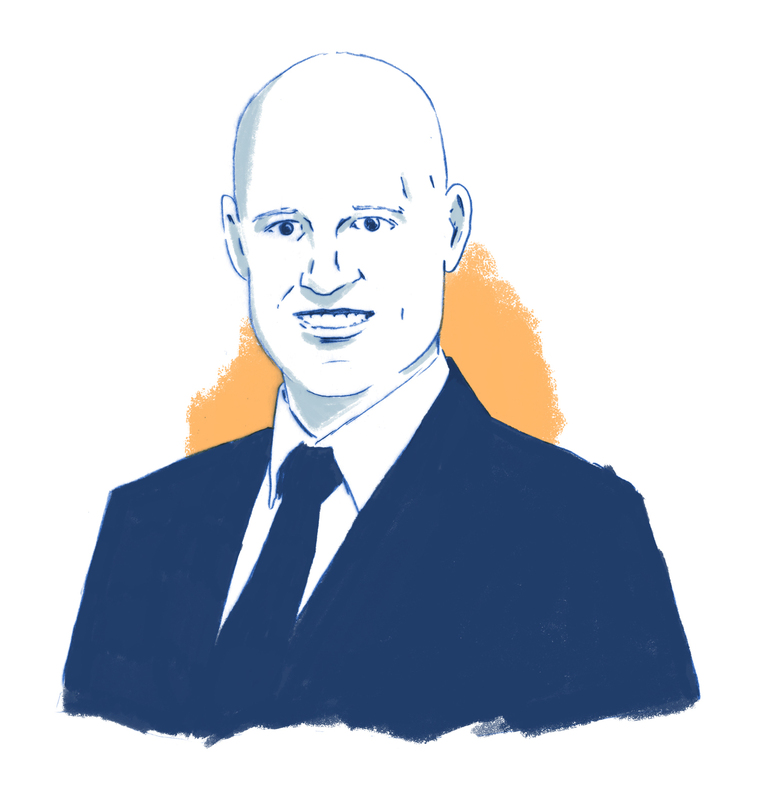 Scott Good is a senior consultant of Uptime Institute Professional Services, facilitating prospective engagements and delivering Tier Topology and Facilities Certifications to contracted clients. Mr. Good has been in the data center industry for more 25 years and has developed data center programs for enterprise clients globally. He has been involved in the execution of Tier programs in alignment with the Uptime Institute and was one of the first to be involved in the creation of the original Tier IV facilities. Mr. Good developed and executed a systematic approach to commissioning these facilities, and the processes he created are used by the industry to this day.